I still have a way to go but I thought I’d post a sneak peek of where I arrived at in terms of design. 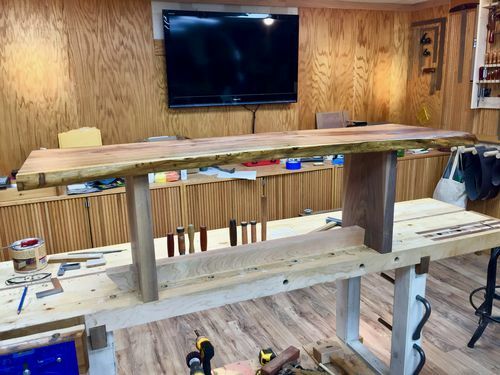 As of now, the slab just sits atop the two walnut uprights without any form of connection. Since I flattened the underside of the slab as well as the finished side, it’s rock solid and doesn’t move unless the top is picked up. 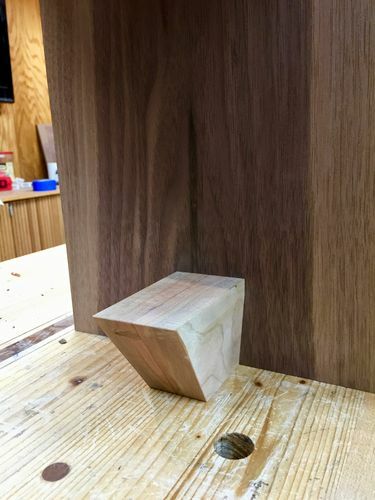 I thought I might use wedged thru mortises of some kind to keep everything stable and connected, but the mesquite is actually pretty heavy and doesn’t move unless the intent is to do so. 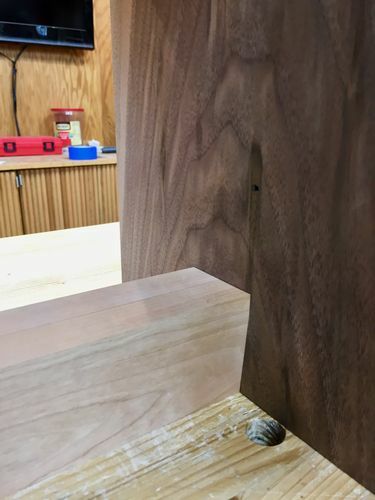 However under consideration is cutting loose tenons from some cherry and have them pass thru the top into the walnut and then wedge them from the top with some walnut. I could also create tenons on the top of the walnut uprights and then do non-thru mortises. Both options are always a possibility, but I like the look of the natural slab and maybe that would spoil the look. Nakashima also always seems to keep the slab free of anything that would take away from the natural appearance. Actually in some instances, he used screws from the underside to secure the top. As for the base. 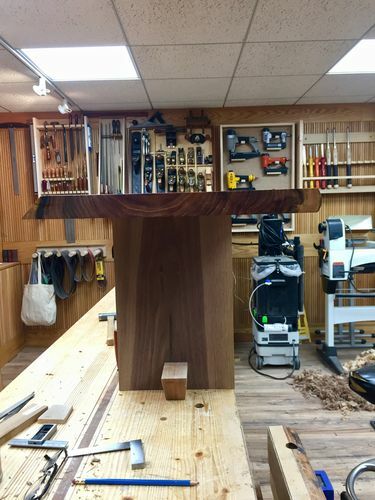 The stretcher may get shorter and/or both walnut uprights may get pushed further to the center as the table looks more like a bench than a table :) It’s also a little taller, at 17” than I think I want it to be. I left the walnut uprights a little longer incase I wanted to make the M&T connection. I guess I’ll have to do some sketches to see what appears best. I just set this up to get a feel for the stability and to see how well my hand work was. I’ll have to say myself, it wasn’t bad at all and the base is rock solid. Here are some progress pics. Unfortunately I didn’t have any 8/4 cherry and sourcing stock here in Pittsburgh has been more difficult than I anticipated. So I had to laminate the 5/4 I had. I’m not thrilled seeing the seam, so I may try to mask it by finishing the cherry with a stain that will more closely appear as aged/oxidized cherry, making it darker. Then the entire base will get an oil finish to complete it. Work remaining is to hand scrape and apply finish to the base components. I also need to complete the finish on the top. Very nice. The seam doesn’t look terribly awful. The legs and top will blow the viewer away. That is awesome wood Bill, I love the way you did the stretcher! Thanks for building that for me, I’ll PM you my shipping address. I don’t think the stretcher will shrink to any critical extent. I vote for non-through tenons, but you only need one in the center of each leg. 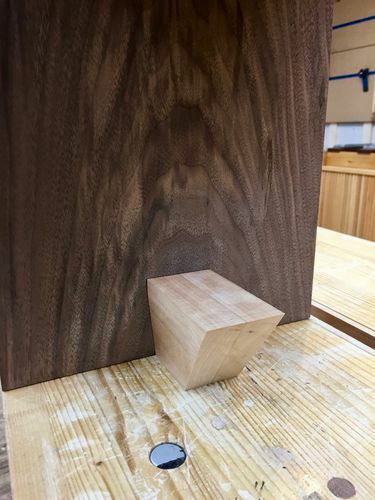 If by chance the stretcher does shrink, you can always pare off a little of the tenon. Thanks Gene. 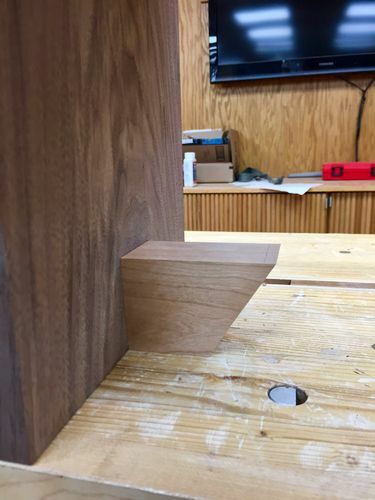 I think I can work and live with the seam in the cherry. I didn’t get a pic of it, but it actually has some neat figure along the top that’s book matched. It’s even more apparent in the sap wood. Hopefully when the finish hits it that will bring that out further. Duck lol Well I do appreciate the idea that someone else would want something I made :) That’s a complement of the highest order. I don’t think the stretcher will shrink either and actually it’s a pretty tight fit without any kind of pinning. 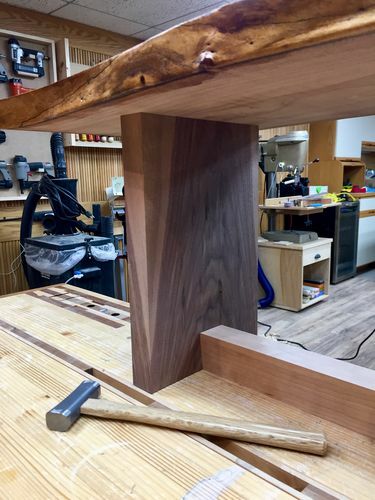 The tenons would be for the slab to hold it fast to the walnut uprights. But I think I’m forgoing them and allowing gravity to do it’s thing. Should the slab go moving about I can always make them or come up with another solution. If you do need tenons down the road, just make some loose tenons not glued. Bill, you do good work, and you’re moving quickly. When you’re done with Duck’s table, you can make me one! That is well on its way to being a nice looking table. Well, as long as we’re putting our orders in, put me down for one, too. Heck, I’ll even supply the mesquite slab. OK ok. lol Gee wiz guys. Now you’re blowing air up my shop smock lol At least Gene will supply the slab ;P And I’m not sure why he would need me to make it for him. I just saw his beautiful river table. That’s a stunner Gene. Don’t know how I missed it. Really nice work! Actually your projects list has quite a lot of beautiful work. Wow! Many thanks Bill. It’s too bad you’re not closer. I have a nearly inexhaustible supply of mesquite slabs nearby. Cheap, too. The slab used for the river table was about 50% bigger and I paid $20 for it. Got enough left for a nice sized end table. How do you like working with it? I love it. But, I’m weird. I actually liked working with it. Mills pretty nicely. Just had to make sure I kept sharpening the irons on my planes often, but really just to touch up the edges to they took clean whisper-thin shavings. Packing and shipping would probably eat you alive. :-) My slab was 3” thick, about 6’ long and, in places, 24” wide. Didn’t weigh it but it was HEAVY! Took both the wife and I to muscle it out of the truck and on to the bench for prep work. ...allowing gravity to do it s thing. Nah, I don’t see any possible issue there. ;-) In all truth, I probably would add some loose tenons just in the event someone bumps it or kids decided to use it for a jungle gym or drunk uncles get in a fight at Thanksgiving. And I’m with you Bill, $20 for a slab of Mesquite like Gene’s? I’ll take at least a dozen! Ah no kids but I do have some lush friends. The slab is pretty heavy. May have to see how it goes before committing to tenons though. I’d be on board with that Bill. I probably wouldn’t really need a dozen ;-) But I’d definitely take a few at anywhere near that price if freight was reasonable!